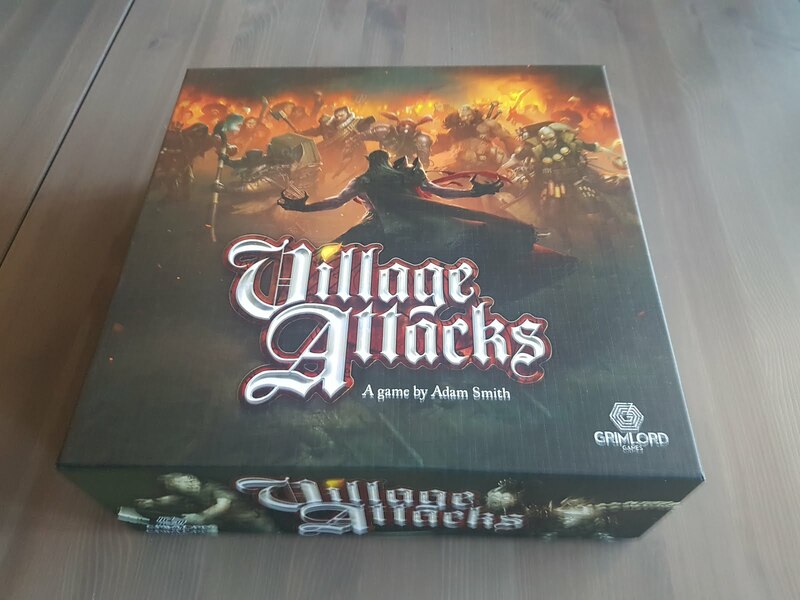 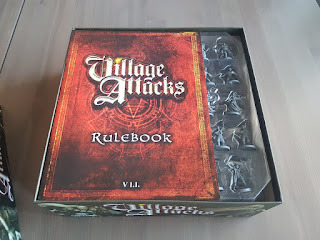 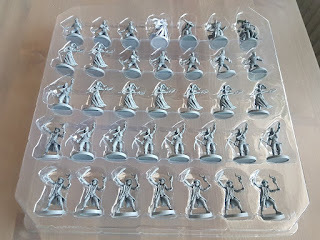 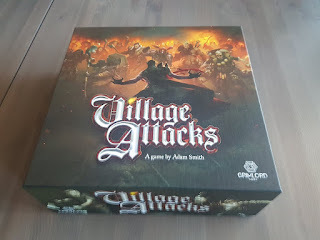 I finally got to open the main box of Village Attacks by Grimlord Games that arrived a few days ago! 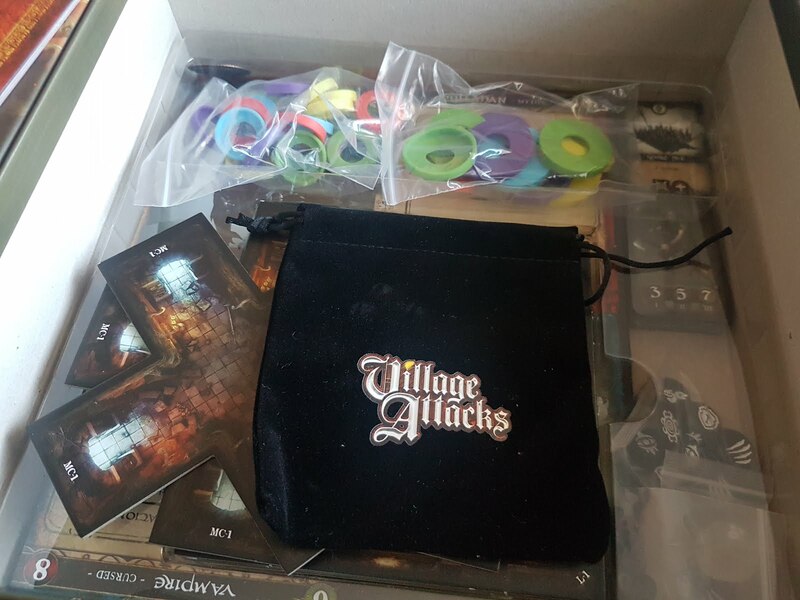 You get a dice/token bag, nice! 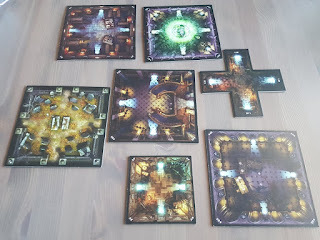 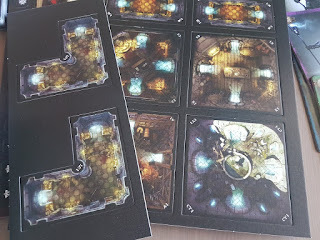 Some of the room tiles, looking good. 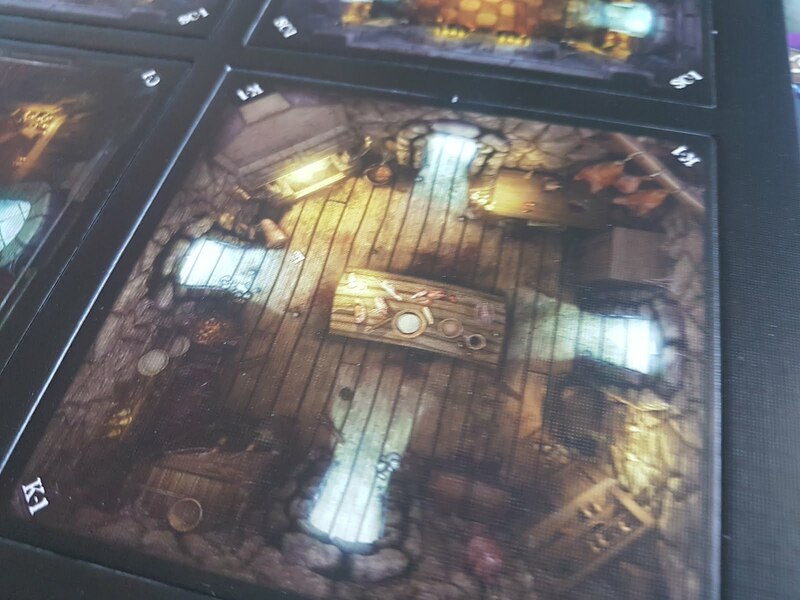 Close-up of a room tile. Nice details in there! 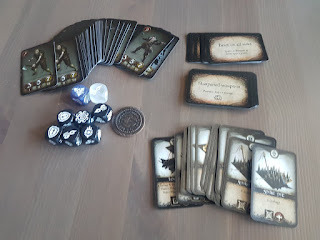 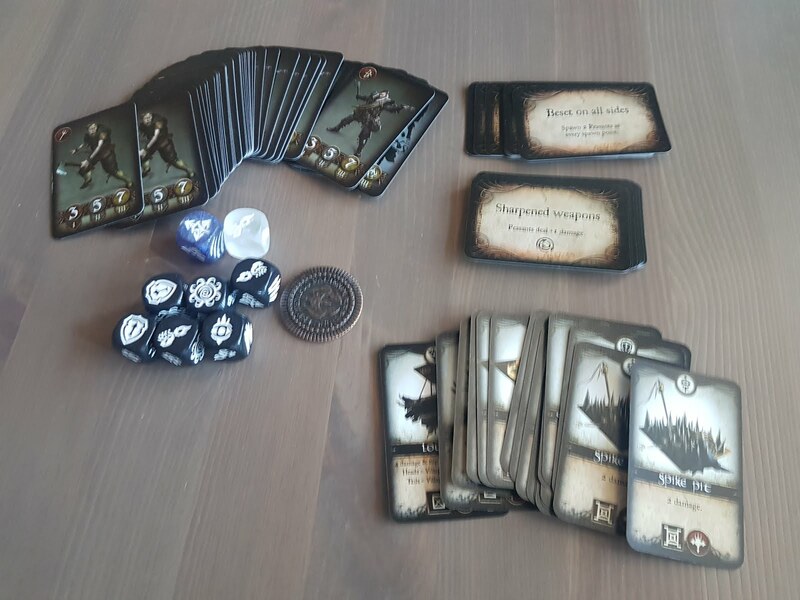 Dice, small cards, and a metal coin! 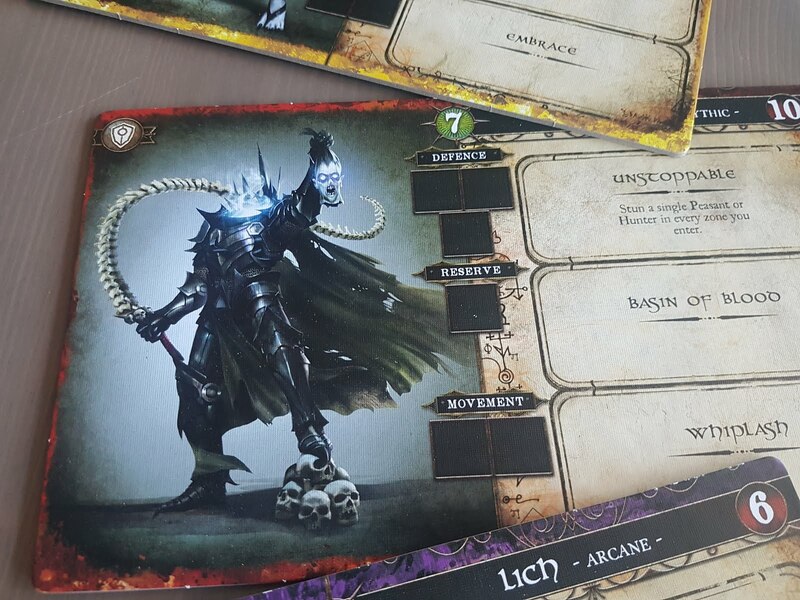 Close-up of the Dullahan monster card. 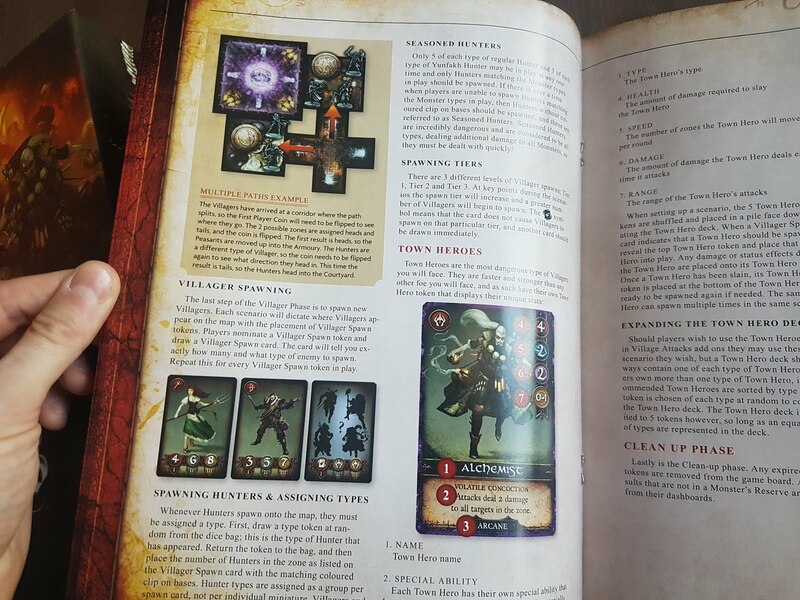 It's cool how you can upgrade your monster's abilities. A peasant for size comparison. 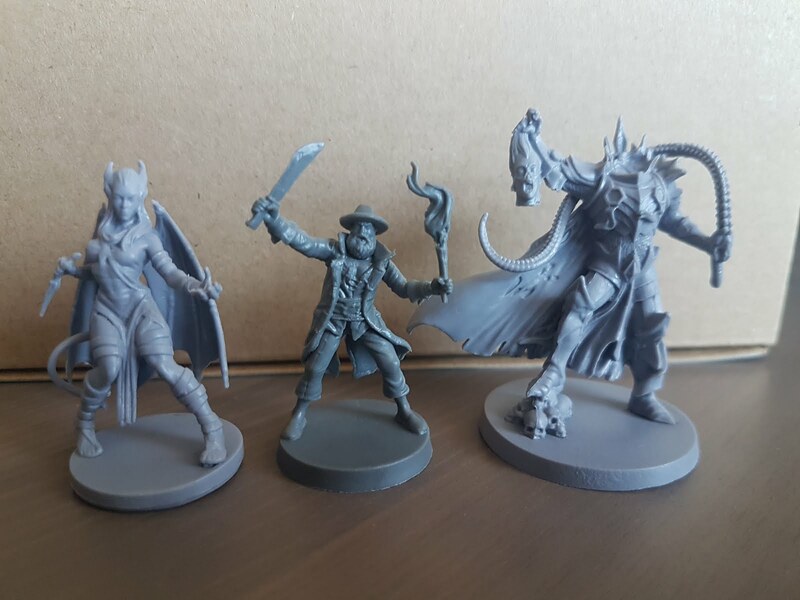 Again, size comparison. That Lich is a big fellow! 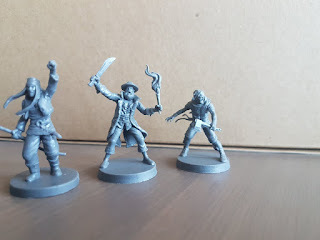 The four Peasant type miniatures. 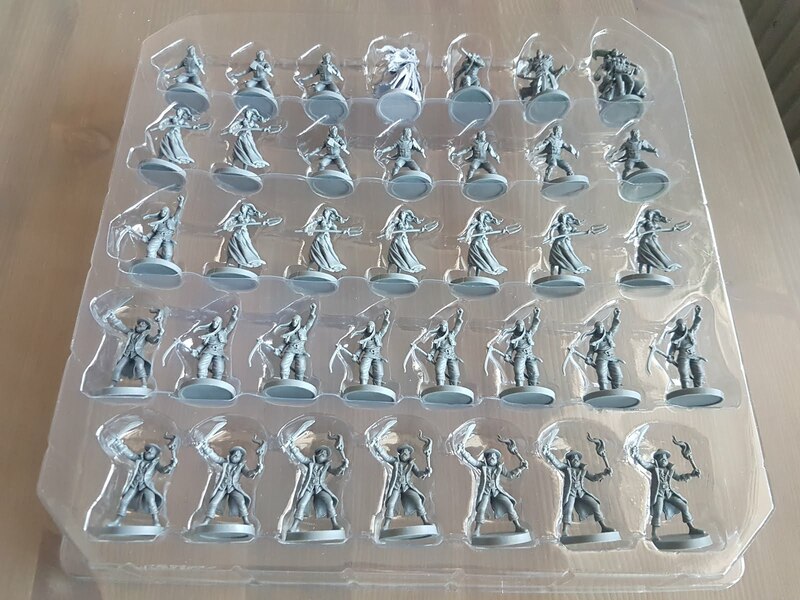 You get a total of 32 peasants. 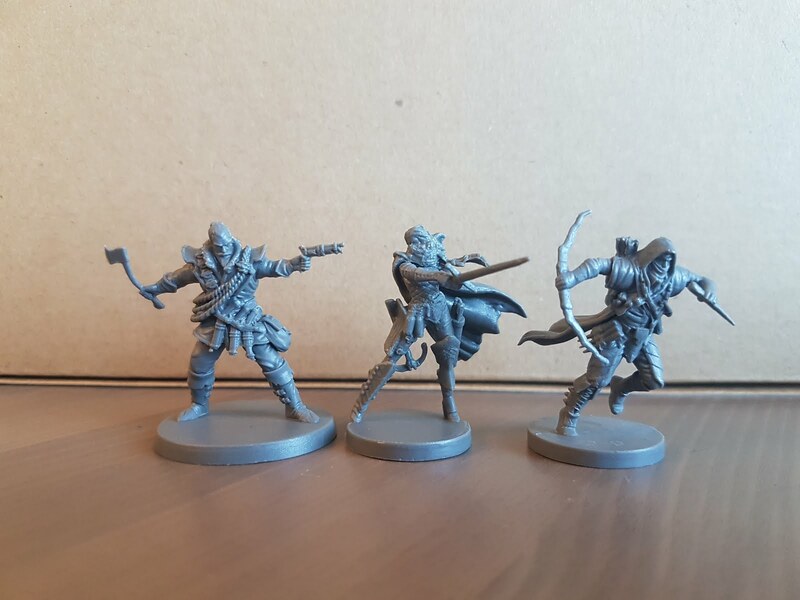 The Hunters types - more dangerous than peasants. 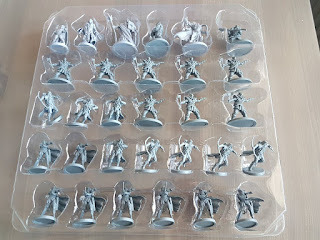 You get 24 of these in the box. 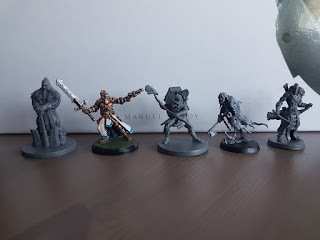 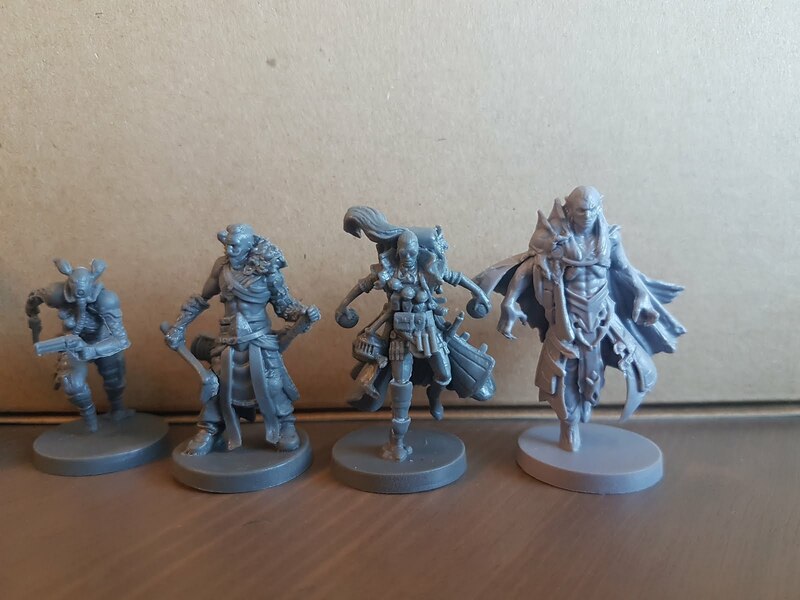 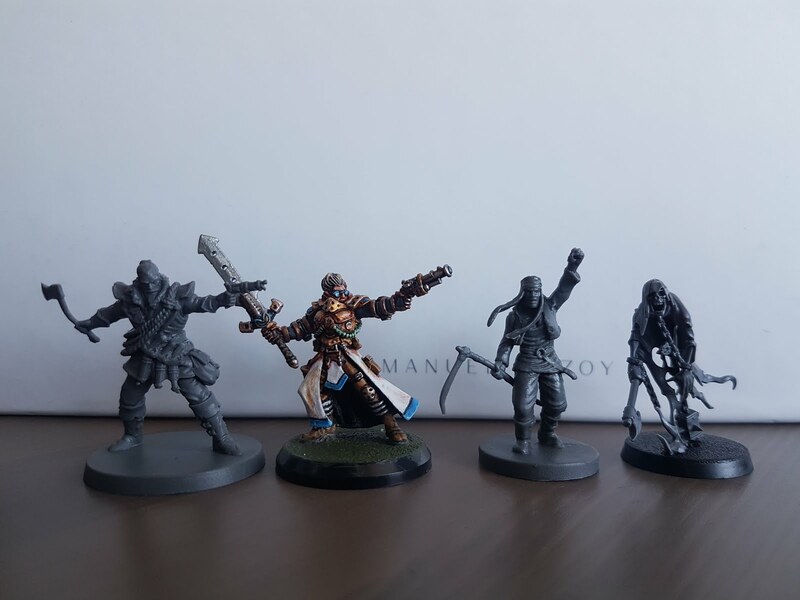 Size comparison of the Hunters. 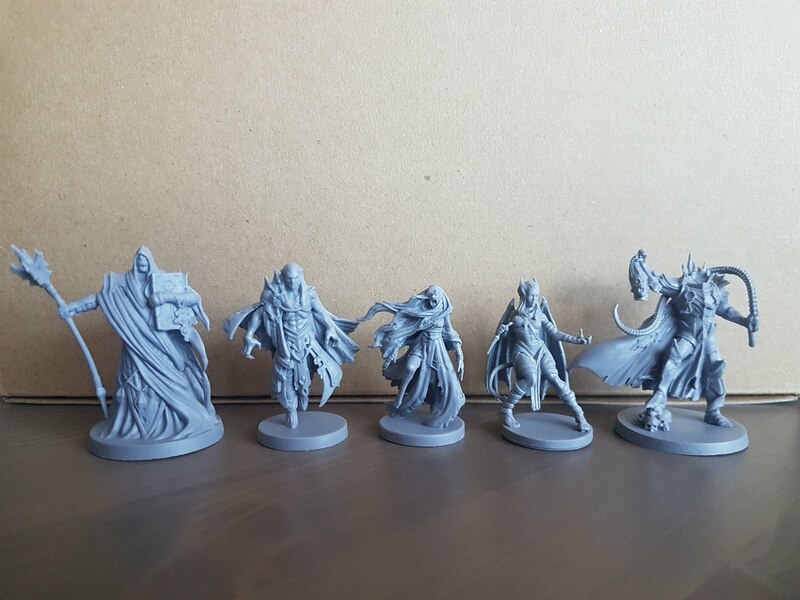 Town Heroes! 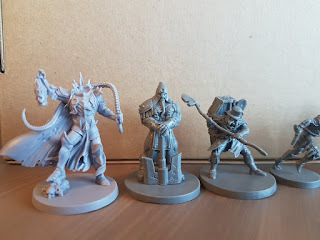 Here are the Executioner and the Gravedigger next to Dullahan. 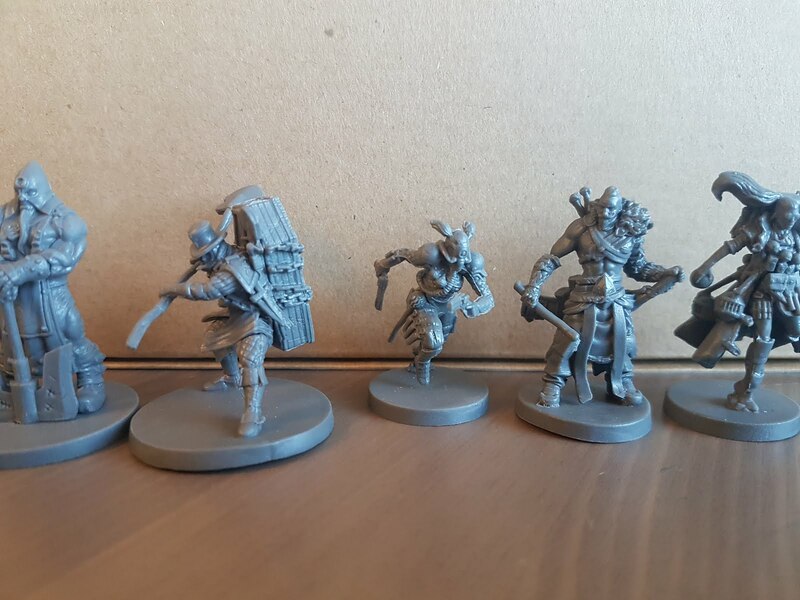 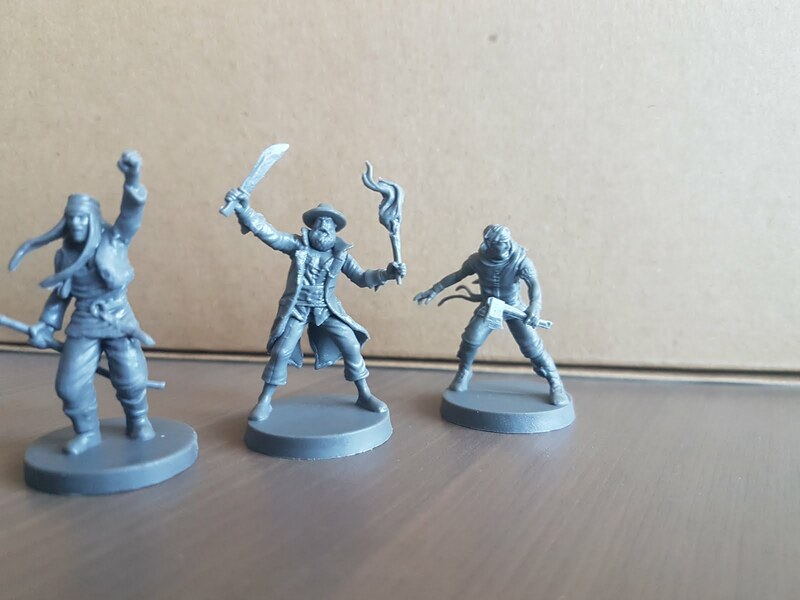 Executioner, Gravedigger, Bounty Hunter, Skald, Alchemist. 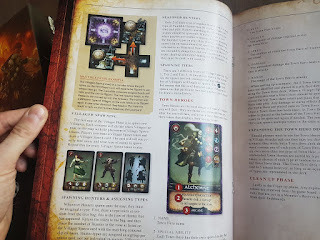 Bounty Hunter, Skald, Alchemist next to the Vampire. 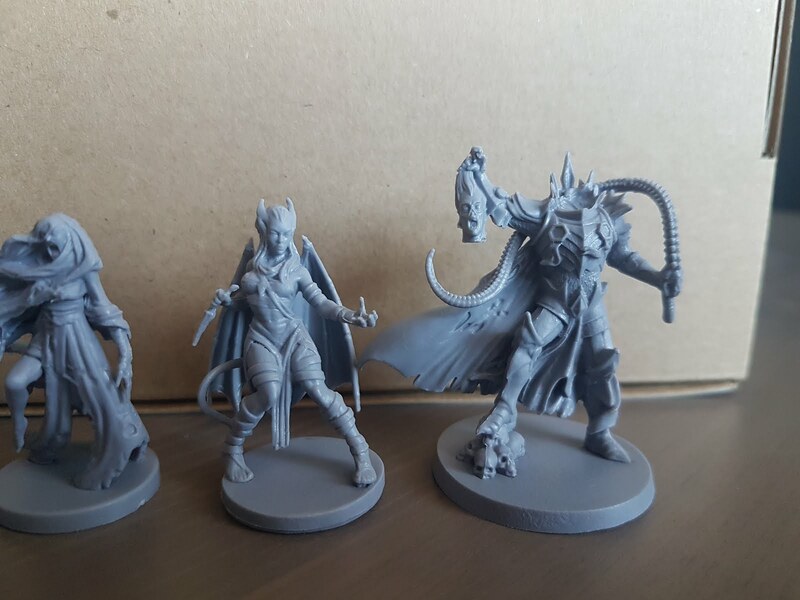 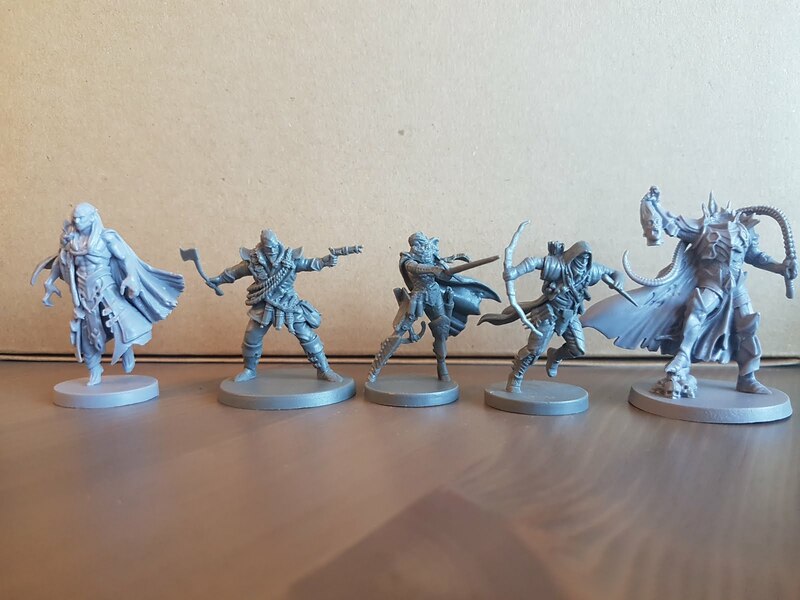 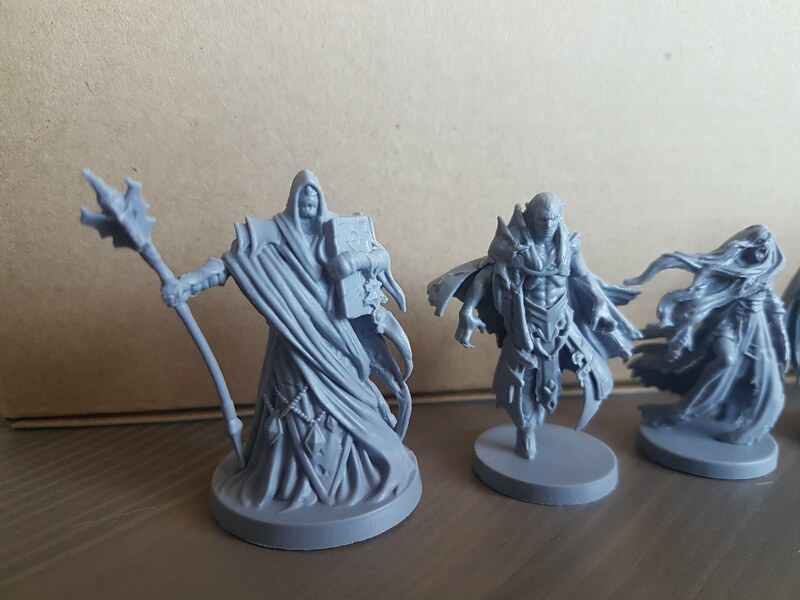 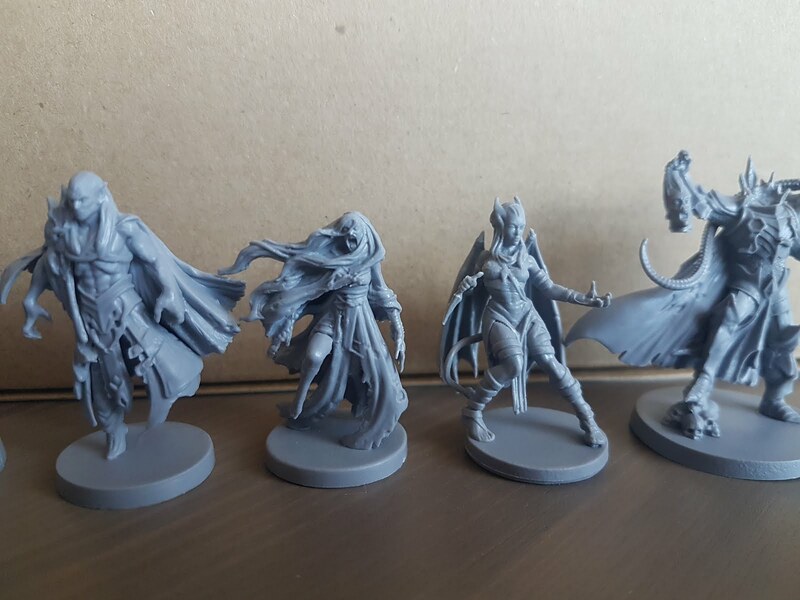 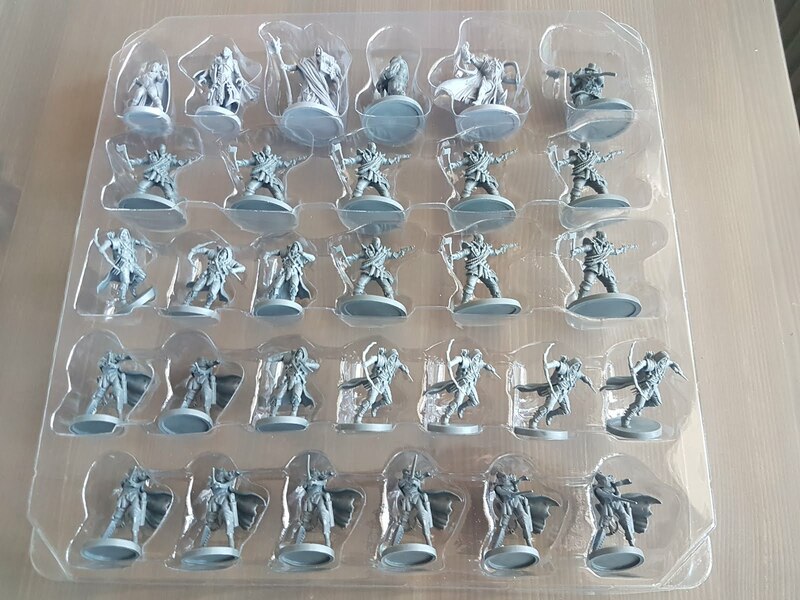 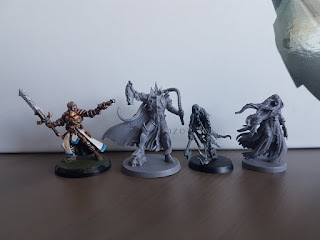 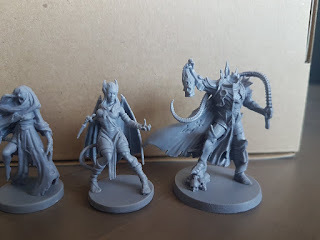 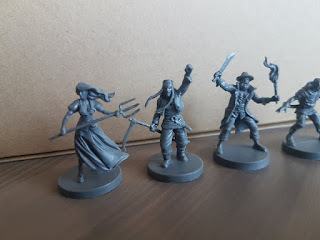 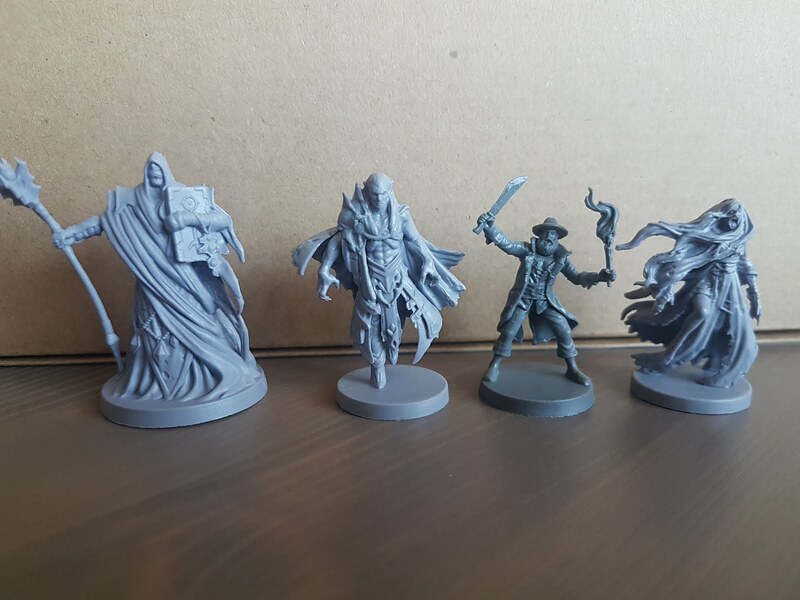 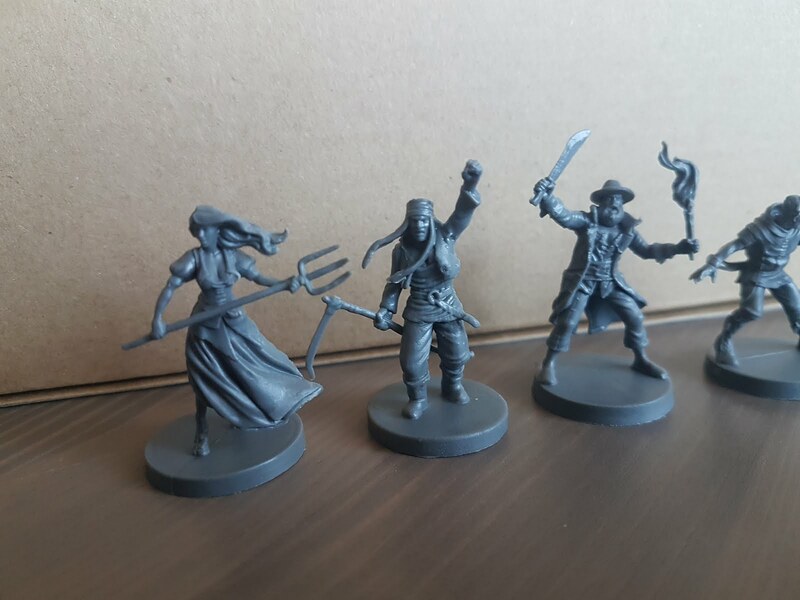 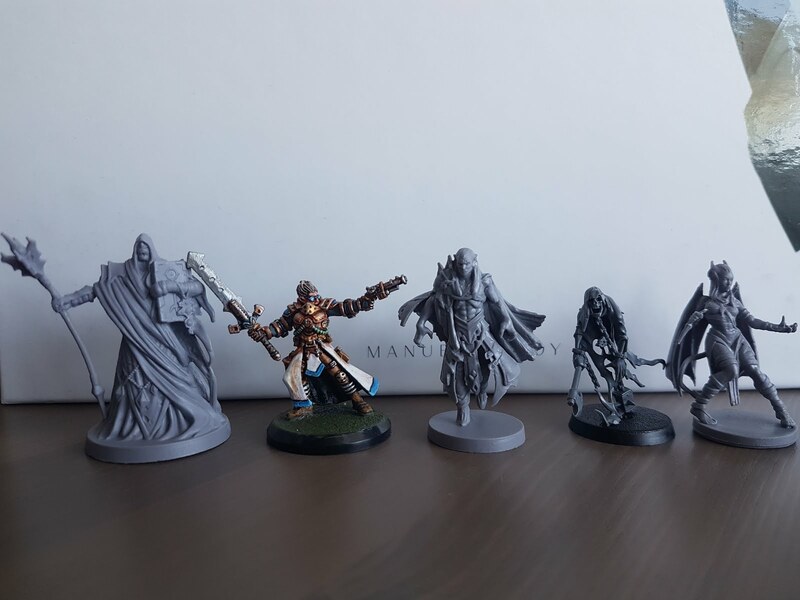 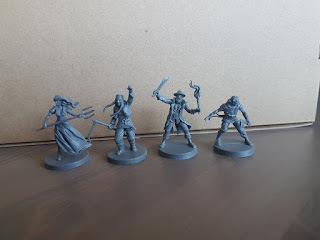 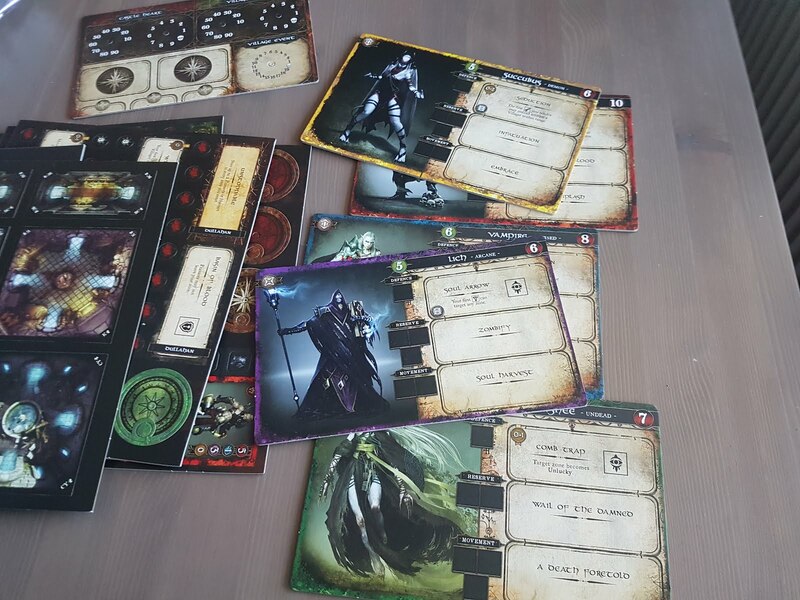 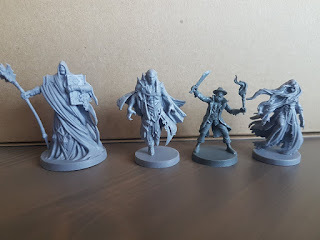 Lich, Stryker (Warmachine), Vampire, Chainrasp (Age of Sigmar), Succubus. 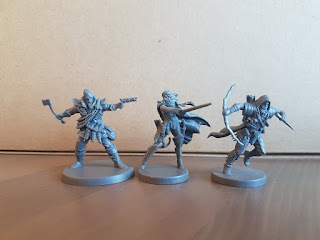 Note the similar poses of Stryker and the Hunter! 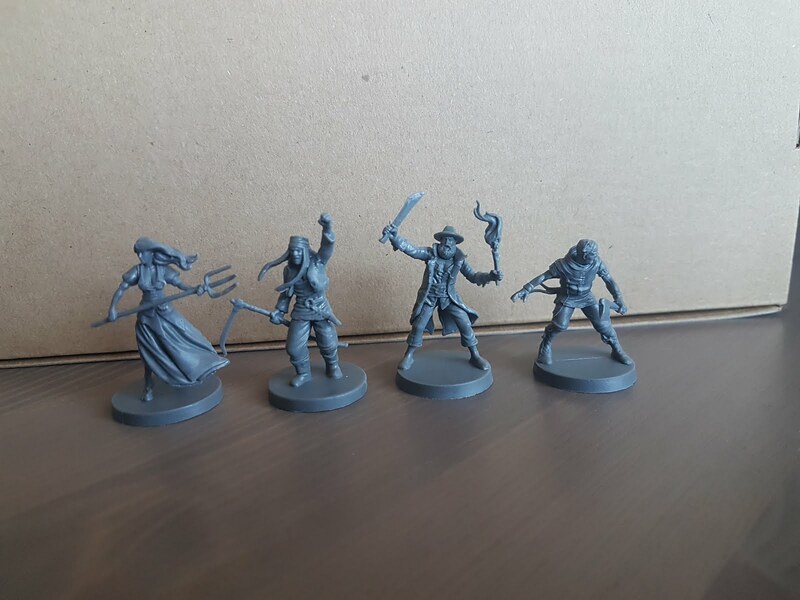 Executioner, Stryker, Gravedigger, Chainrasp, Skald. Next up, the Kickstarter expansions!